The American Trinity Cross is a solid sterling silver pendant in the medium size, 1 5/8", and is made by the traditional lost wax method, hand cast and hand polished. A symbolic ruby, diamond, and sapphire are hand set on its face. Each pendant comes with a beautiful eight-sided sterling silver chain in the length of your choice. and the passion of Christ. It also symbolizes E Pluribus Unum – “From Many, One.” Out of many peoples, races, religions, and ancestries has emerged a single nation: the United States of America. The Diamond represents the purity of Mary. It also symbolizes the official motto of the United States of America, "In God We Trust." The Sapphire represents the grace of Heaven. It also symbolizes liberty, one of the founding principles of the United States of American and expressed in the Declaration of Independence. 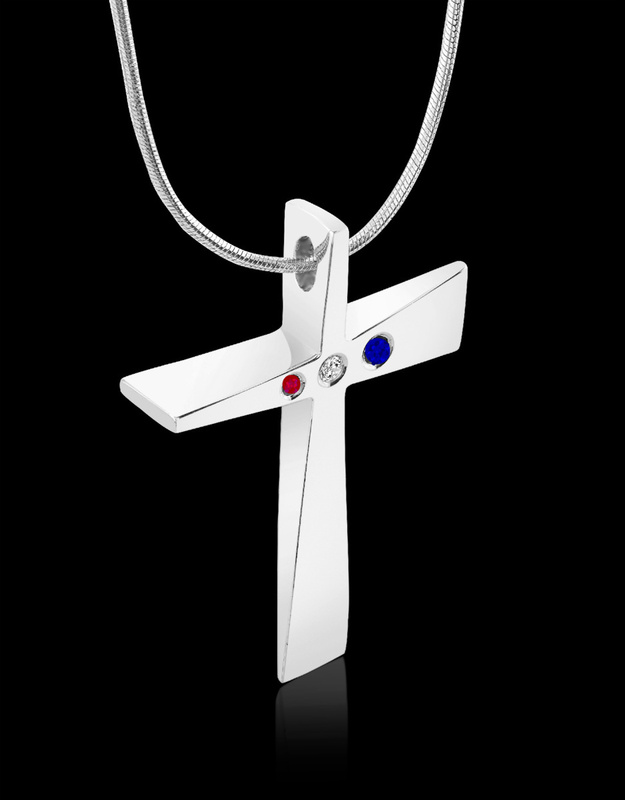 Charles Sherman won First Place in the category of Inspirational Jewelry Design for his unique Trinity Cross design at the prestigious JCK Jewelers' Choice Awards international design competition in 2012. Pope Francis has acknowledged the unique commemorative Trinity Cross that designer Charles Sherman created for him. A copy of the Vatican letter comes with every order.